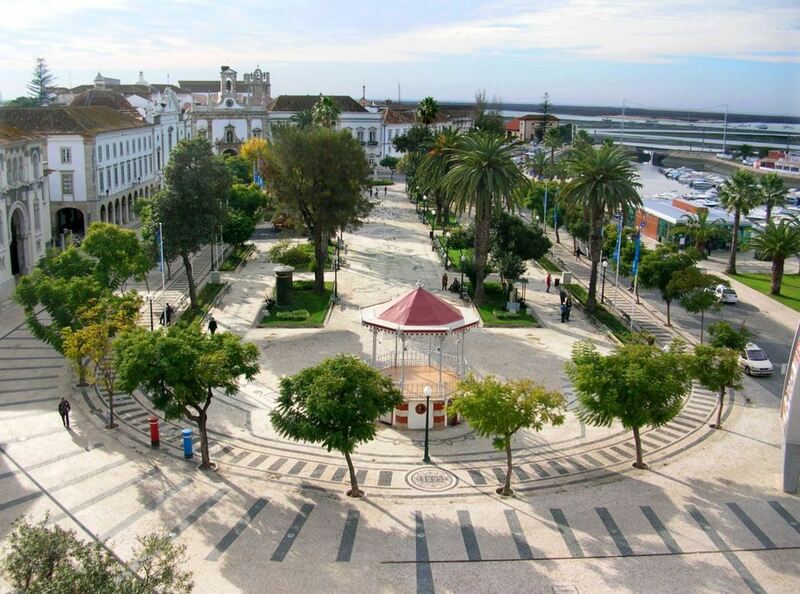 Faro is the capital of the Algarve and the city of arrival for millions of tourists that visit the Algarve. The city is well worth the visit due to its history, entertainment, shopping and local cuisine. If you want to relax, you can enjoy your holiday on one of the beaches nearby or in the natural park of Ria Formosa. During the summer season, there are also many free events and concerts in Faro. After reading this article, you will be the tour guide when visiting Faro. 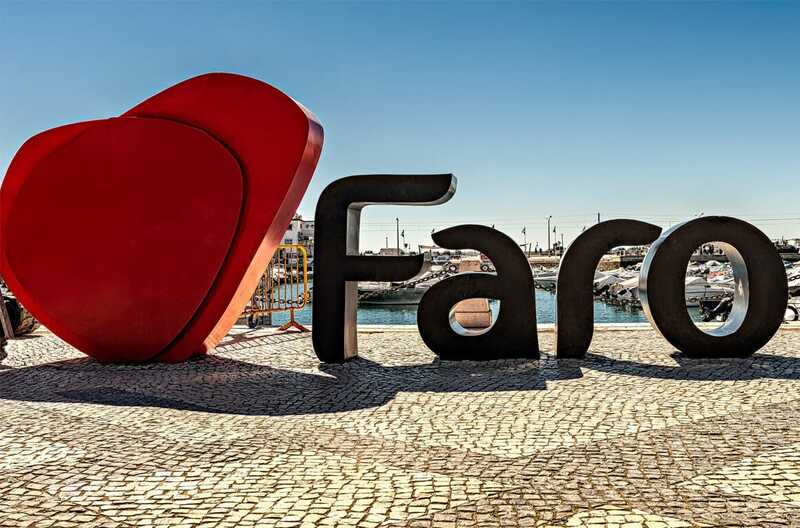 Are you excited to visit Faro? Watch the short video below to see the highlights of the city. 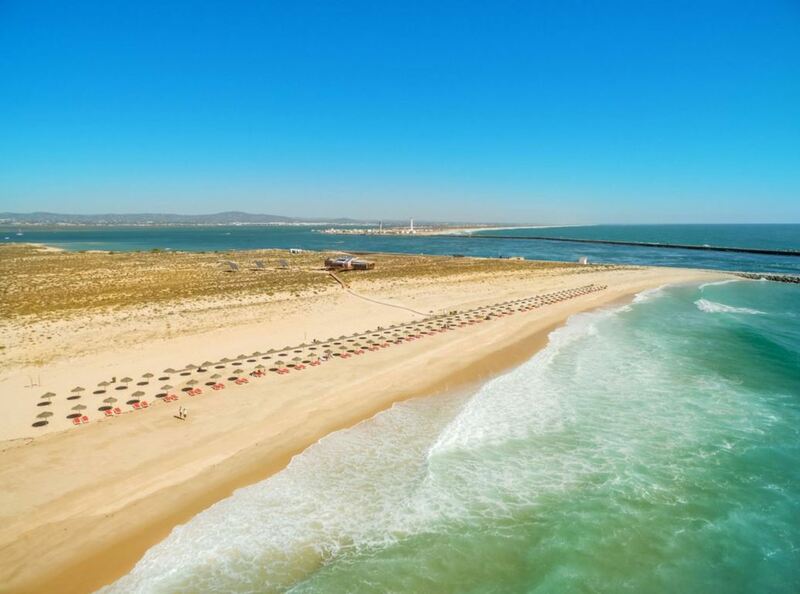 If you are in Faro, you have several great beach options. Below you can find our favourite beaches in the area of Faro. Praia de Faro. 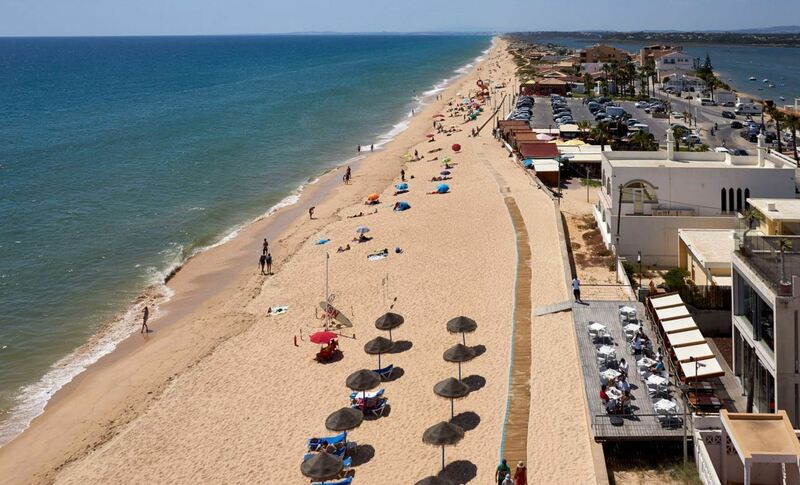 This is the main beach of Faro. It is a wonderful beach, stretching for about 5 kilometres. 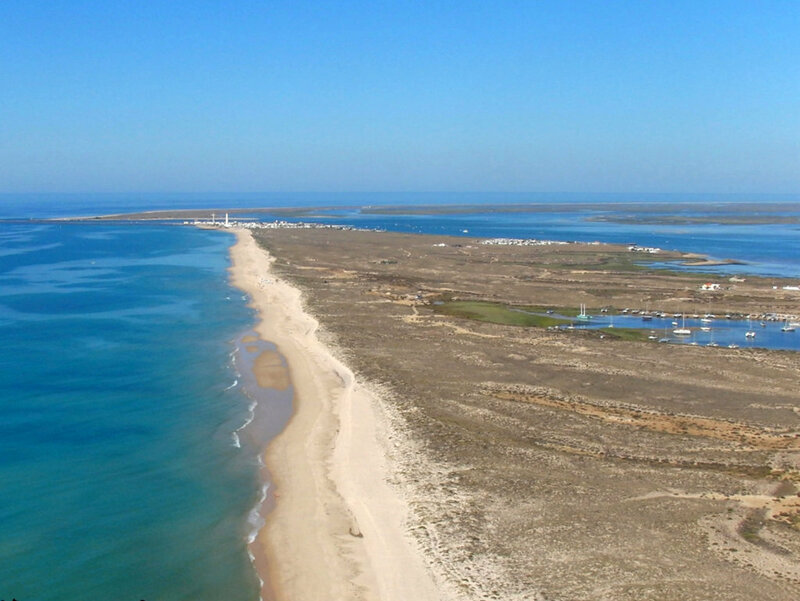 Praia de Faro is located near the airport and the natural park of Ria Formosa. There is a bridge to this beach, so it is possible to reach it by car or by bus. Ilha Deserta. The name of this uninhabited island translates to Deserted Island. This is because there are no people who live on the island permanently. The island has one of the most amazing beaches in the Algarve. Ilha Deserta can only be reached by boat. Ilha da Culatra. While this island actually belongs to the town of Olhão, there is a boat from Faro that takes you directly to this beautiful island. You could go to Culatra or Farol, both of which are situated on the same island. Great for a day trip. Faro has many restaurants and it will not be difficult to find a good affordable restaurant. A lot of restaurants serve Portuguese food, but there are plenty of other options as well. Below you can find our favourite restaurants in Faro. Tasca do Ricky. This traditional Portuguese restaurant offers delicious food and good service. The restaurant is quite small, so you have to make a reservation in advance. Peixe Assado Moinhos do Grelha. 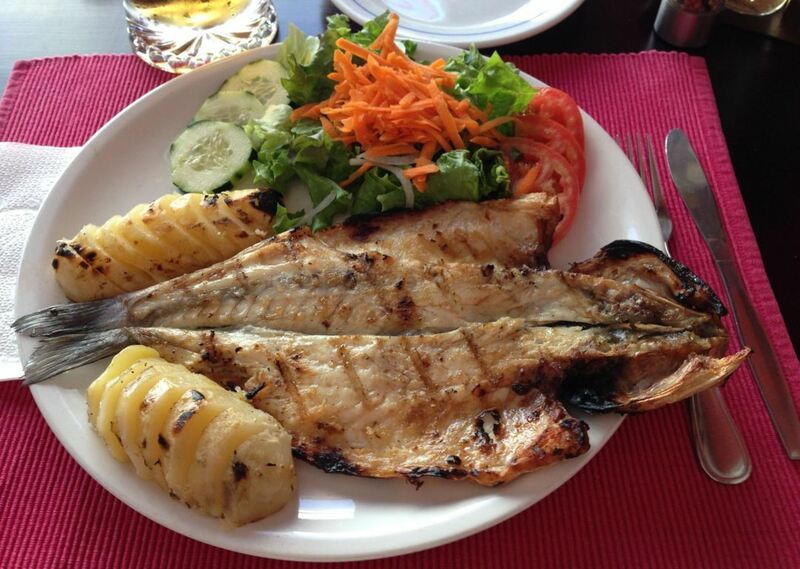 This Portuguese restaurant offers amazing fresh grilled fish. There is no menu. It is an all you can eat of fresh grilled fish concept. Side dishes as tomato salad, potatoes, bread and olives are included. 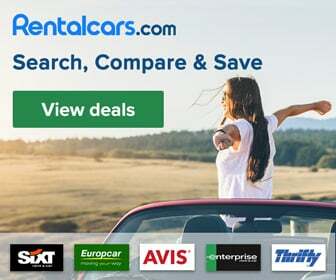 Great value for money, as it is not expensive at all. A favourite among locals. Pizzeria Atlantis. 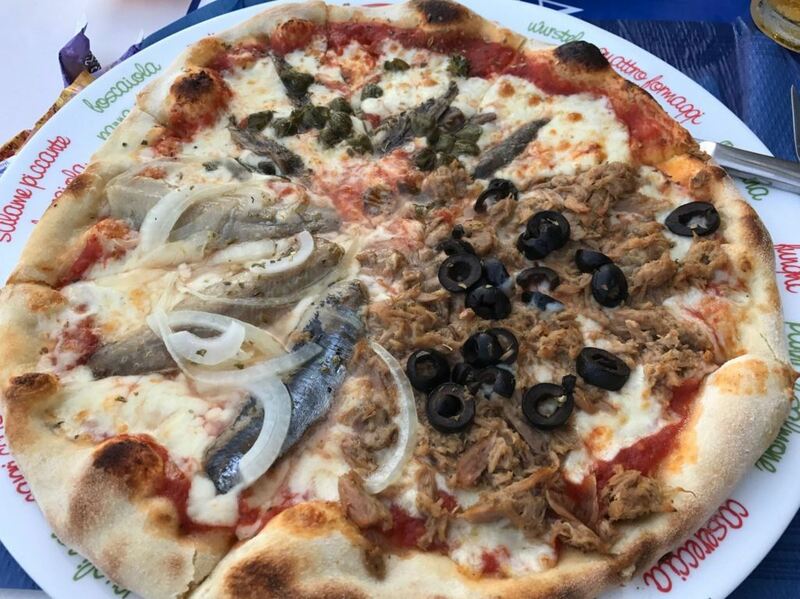 This Italian restaurant serves perhaps the best pizza of Faro. The quality of the food is really good and the staff is very friendly. Alef Burger Bar. If you love burgers, this is your place. All burgers are fresh and homemade. It is not a fast food place. They have several tasty burgers, including vegetarian options. Ptit Bistro Republique. 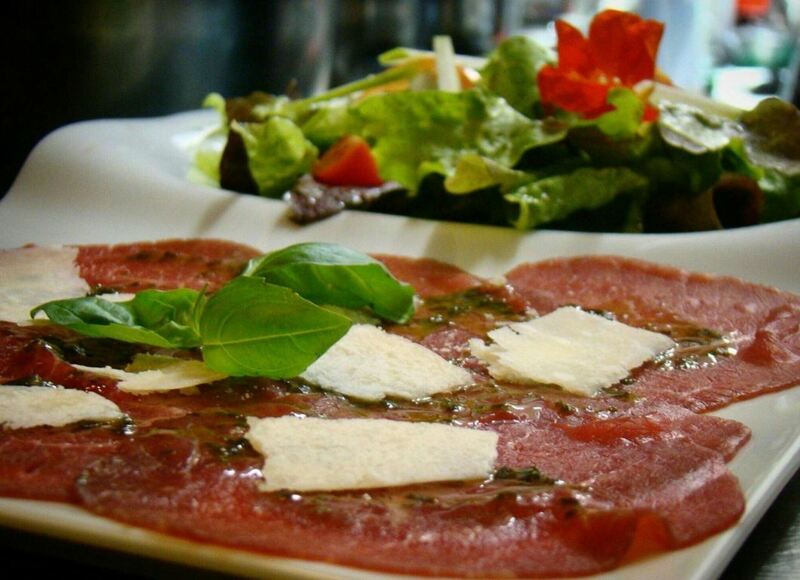 This superb French restaurant offers the highest quality fresh food. The French chef makes sure you won’t forget this dining experience. One of the most upscale restaurants in Faro. Located near the marina. Ria Formosa Restaurant. This restaurant is located on the rooftop of Hotel Faro, overlooking the marina. The food is amazing and the service is outstanding. If you want delicious food with a great view, go here. Faro is a small city, where all the main sights are within walking distance. Below you can find the most important highlights of Faro. Faro has a beautiful, historical old town, where also many restaurants and cafes are situated. A great starting point to discover the old town is the garden Jardim Manuel Bivar (near the marina). From the garden Jardim Manuel Bivar, walk through the town’s gate Arco da Vila. This gate was rebuilt after the earthquake of 1755. Notice the statue of St. Thomas Aquinas, the Patron Saint of Faro, above the gate. On the left of the gate you can find the tourism office. Go through Arco da Vila. After about 100 metres you arrive at Largo da Sé. This is the main square. 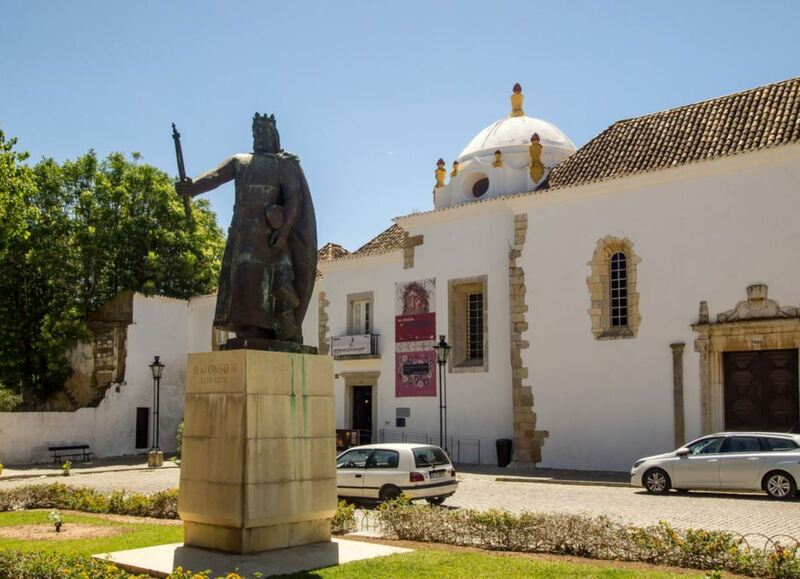 On the square, you can find the statue of Dom Francisco Gomes do Avelar, who was a bishop of Faro in the 18th and early 19th century. Near the main square you can also find the town hall. This building was built in the 19th century. Near Largo da Sé you can see the Cathedral of Faro, also known as Sé Catedral de Faro and Igreja da Sé. 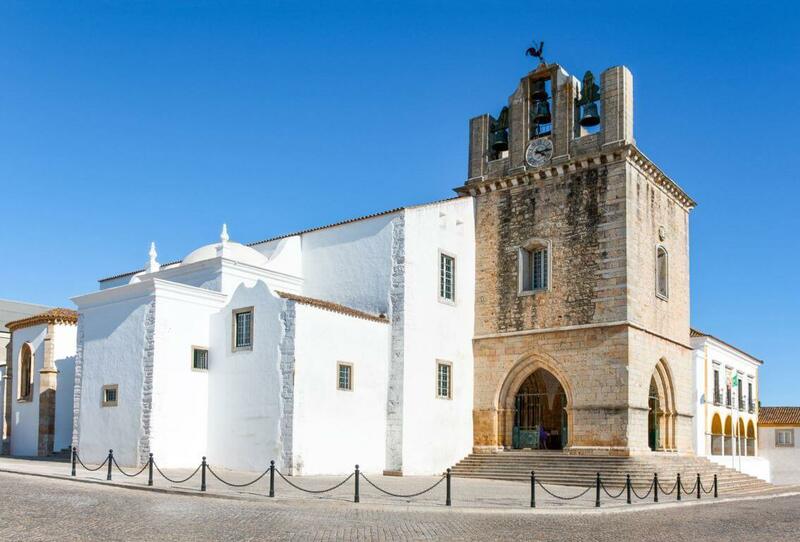 It was built in the 13th century and is one of the most important historic buildings in Faro. You can climb up the bell tower by taking 68 steps. 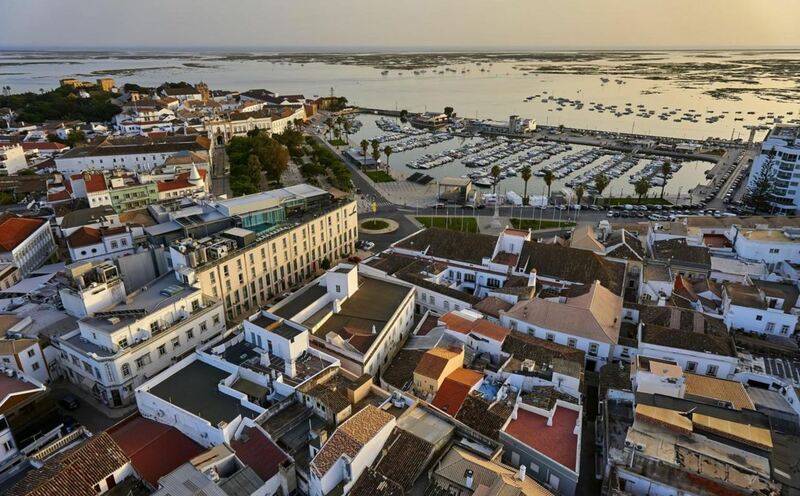 From the bell tower you have a breathtaking view over the surrounding area and the Ria Formosa. Especially the interior of the cathedral is really beautiful. Entrance costs about € 3,50, but is highly recommended. In the southwest of Largo da Sé there is a small gate in the city wall. It is called Porta Nova (New Gate) and was built in the 15th century. It connects the waterfront with the old town. Through the gate you can see the coast of Faro with lagoons and sandy islands. 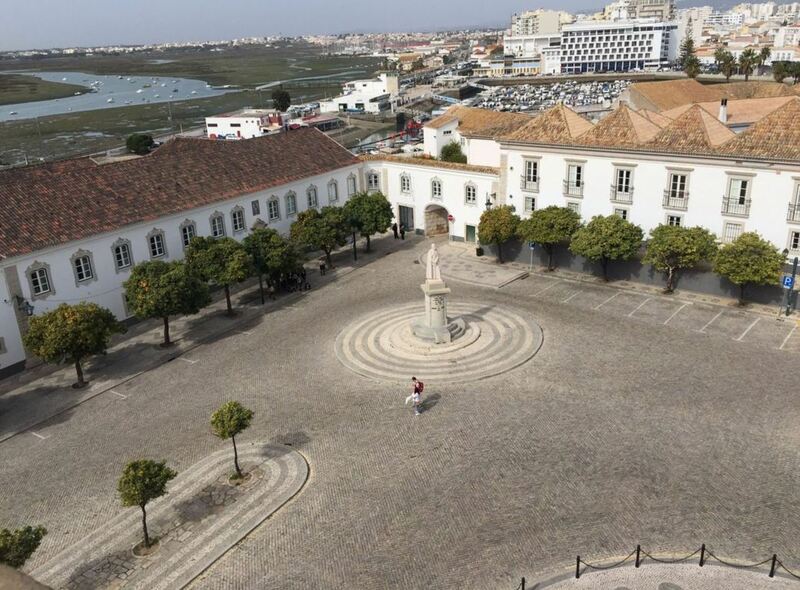 There is another important square in the old town, called Praça Afonso III. Here you can see the statue of the Portuguese king Afonso III. Afonso III was the first king of Portugal. He expelled the Moors from the Algarve by conquering Faro in 1249. As a result, the Algarve became part of the kingdom of Portugal. 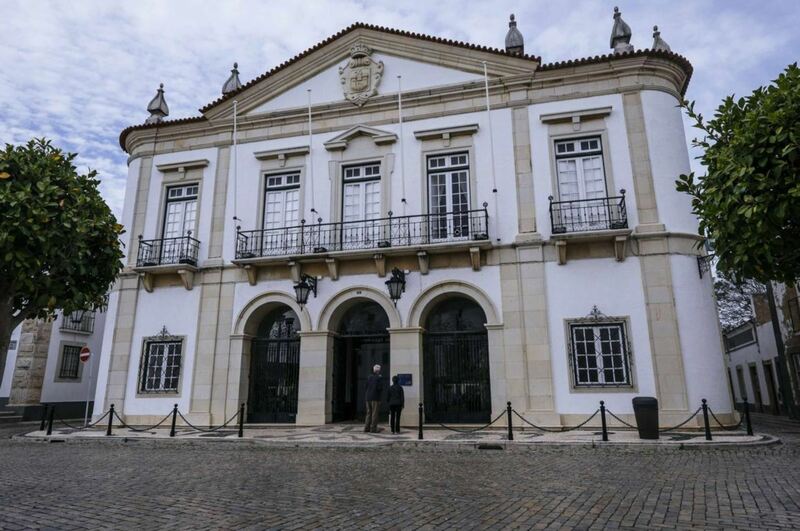 On the southern side of the Praça Afonso III square you will find the Museu Municipal de Faro, also known as the archeological museum. 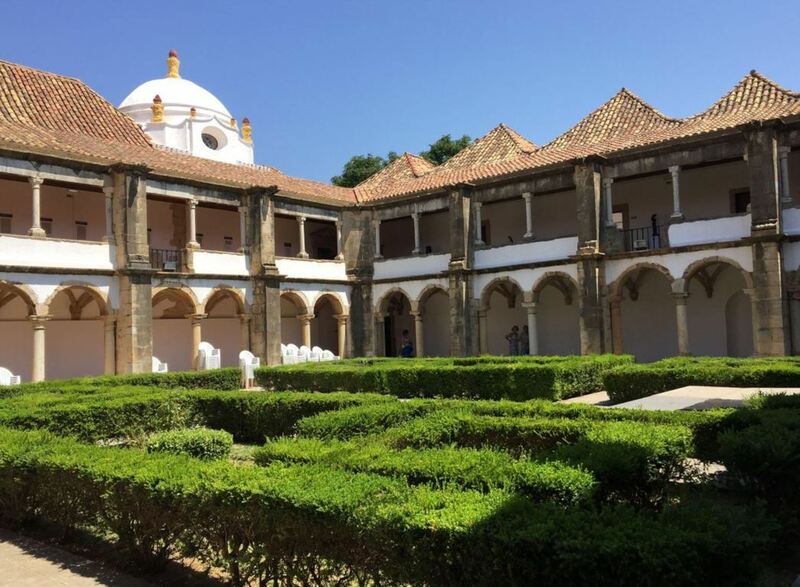 The museum is housed within a former convent, called the Convent of Nossa Senhora da Assunção. It was built from 1518-1523. The museum is a great place to learn about the history of Faro. Entrance costs only about € 2. In the museum you will see Roman Mosaics from Ossonoba, Roman statues from the excavations of Milreu, glazed tiles dating from the 16th century and much more. 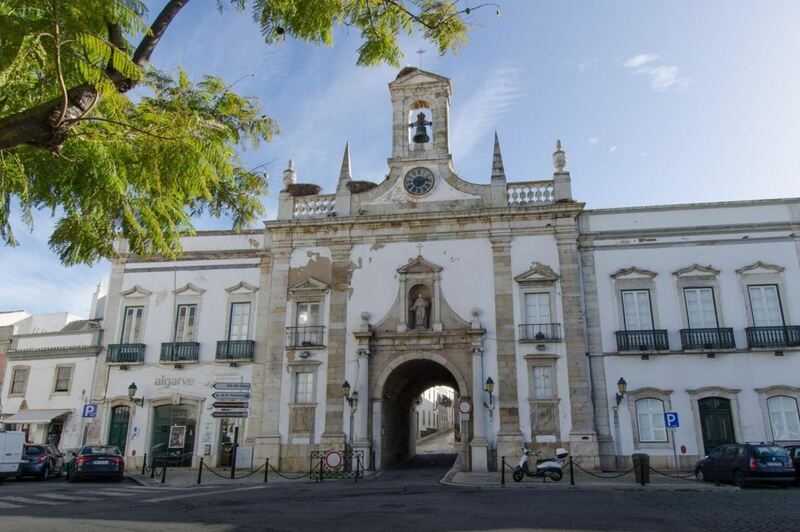 Another entrance to the old town is through the Arco do Repouso (also known as the Arc of Repouso). 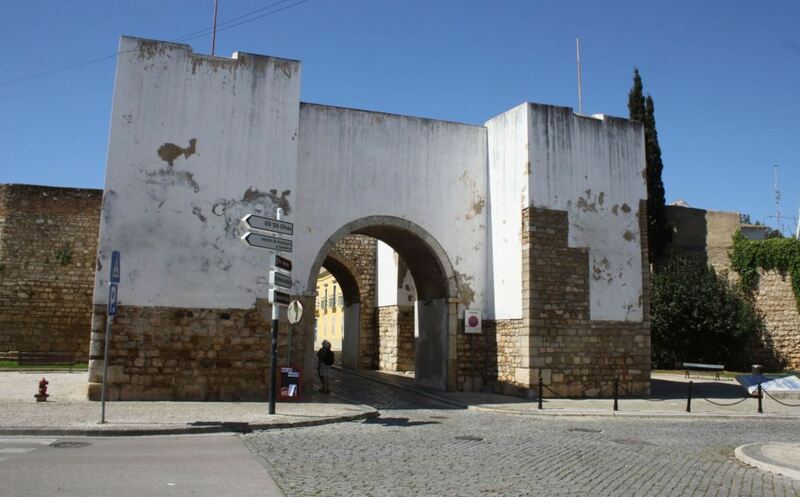 Together with Arco da Vila and Porta Nova, this is one of the three entrances to the old town. The area around Arco do Repouso is very interesting to walk around. There are narrow cobbled streets and you can see an old lamp, which adds character to the area. 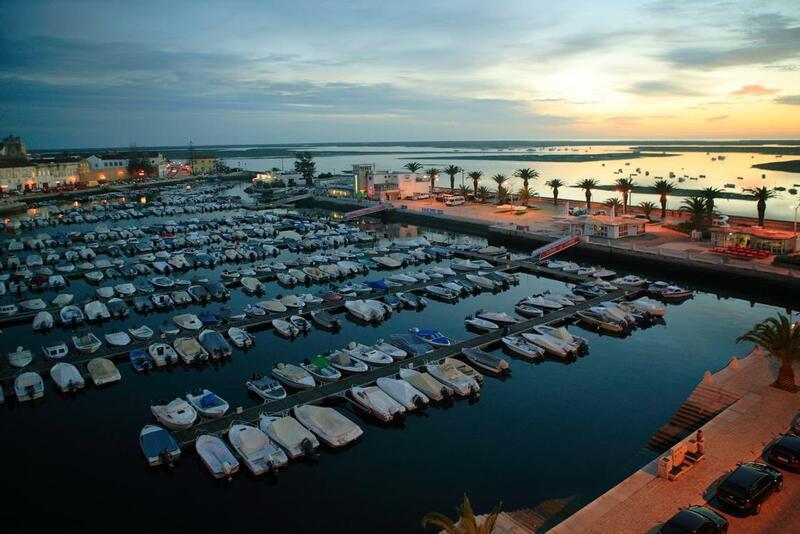 Near the centre of Faro you can find a marina. Here you can admire many beautiful boats and enjoy a drink in one of the bars nearby. During summer, it is very nice to just walk around here in the evening. Near the marina you can also find the Porta Nova Pier, which is the place where boats take you to the natural park of Ria Formosa or one of the islands. 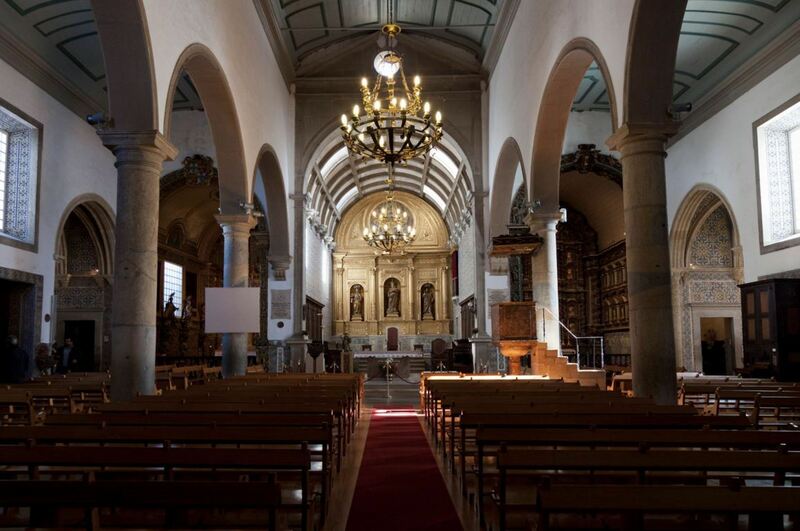 We recommend you to visit the Igreja do Carmo (Carmo Church). It is one of the most beautiful churches of the Algarve. It is known for its beautiful gilt carved woodwork. The church was built in 1719, but the earthquake of 1755 heavily damaged it. The reconstruction of the exterior only finished in 1878. Entrance costs only € 2. Inside the Carmo Church you can find the Capela dos Ossos (the bones chapel). 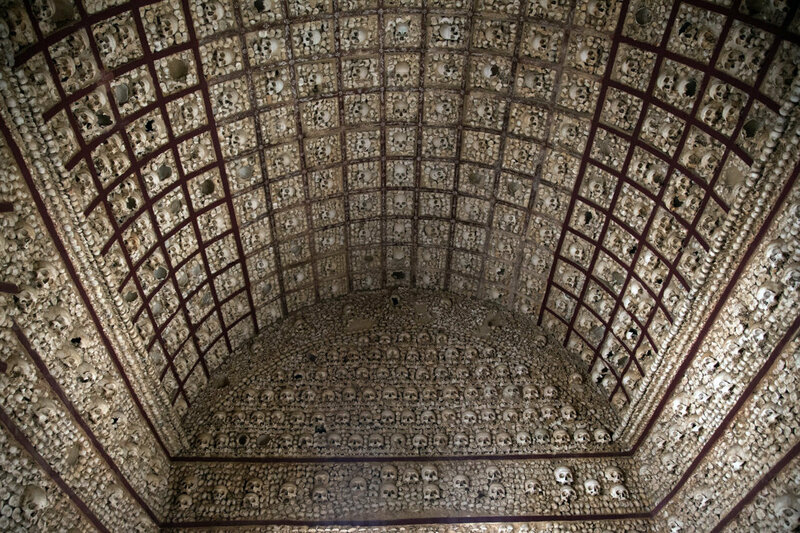 The walls of this chapel are covered with human skulls and bones. It is kind of a surreal feeling to stand in a room which is made from human bones. Above the entrance of the bones chapel, you can find the text: pára aqui a considerar que a este estado hás-de chegar. This text translates to: stop here and consider, that you will reach this state too. The Capela dos Ossos is undoubtedly the highlight of Igreja do Carmo, but at the same time one of the creepiest attractions of Faro. About 9 kilometres above Faro (near the village of Estoi), you can find the Roman ruins of Milreu. These are the ruins of a Roman villa, that were discovered in 1877 by the Portuguese archaeologist Estácio da Veiga. The town of which the villa was a part of, was constructed in the first century. It was probably continuously occupied until the 10th century. 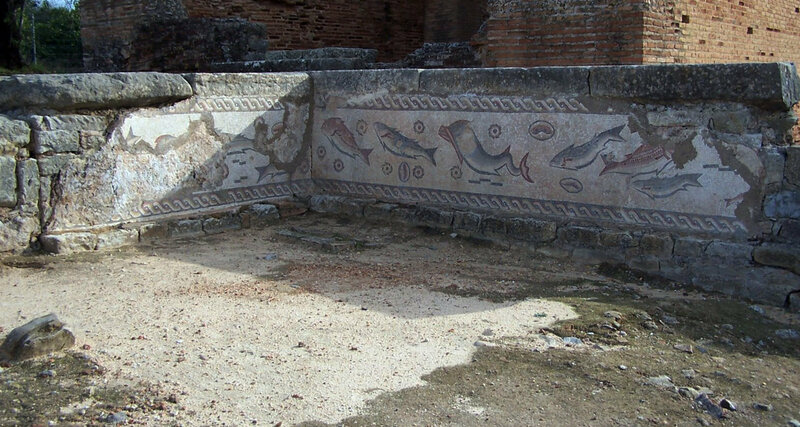 You can see beautiful mosaics with fishes and geometric shapes. These ruins are one of the best preserved places that indicate the Roman presence in the Algarve. Entrance is only € 2. About 11 kilometres above Faro (near the village of Estoi), you can find the Palace of Estoi. This beautiful palace was built in the second half of the 19th century. The palace has been turned into a hotel. Sleeping in this historical place can be an amazing experience, but is quite expensive. If you are not a hotel guest, you can still enter and walk around the building for free. The building is painted in pink and blue. You can take some beautiful photographs of the palace from the outside. 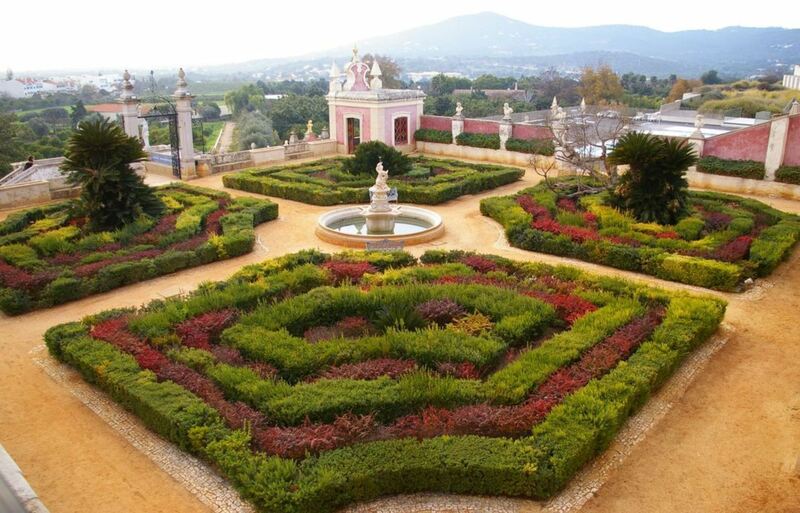 The Palace of Estoi is surrounded by beautiful gardens. It is really relaxing to walk around here. There is a small cafe outside. It is a great place to have a drink and watch the sunset. Definitely worth a visit. 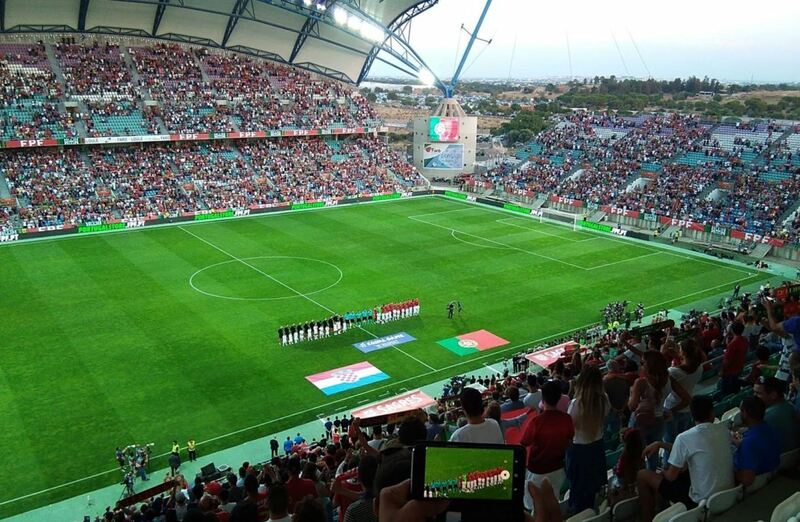 There is a soccer stadium between Faro and Loulé, known as Estádio Algarve. It was built for the 2004 European soccer championship and has a capacity of more than 30.000 people. It used to be the stadium of Farense and Louletano (soccer clubs from Faro and Loulé), but nowadays it is (temporarily) the home ground of the Gibraltar national soccer team. Sometimes the stadium is also used for big concerts and music festivals, but in general, the stadium is rarely used. The stadium is easily accessible by car. With its large student population, Faro has a vibrant nightlife. Nightlife in Faro begins late and ends late. In the summer, you can find people outside in the city center enjoying a beer. 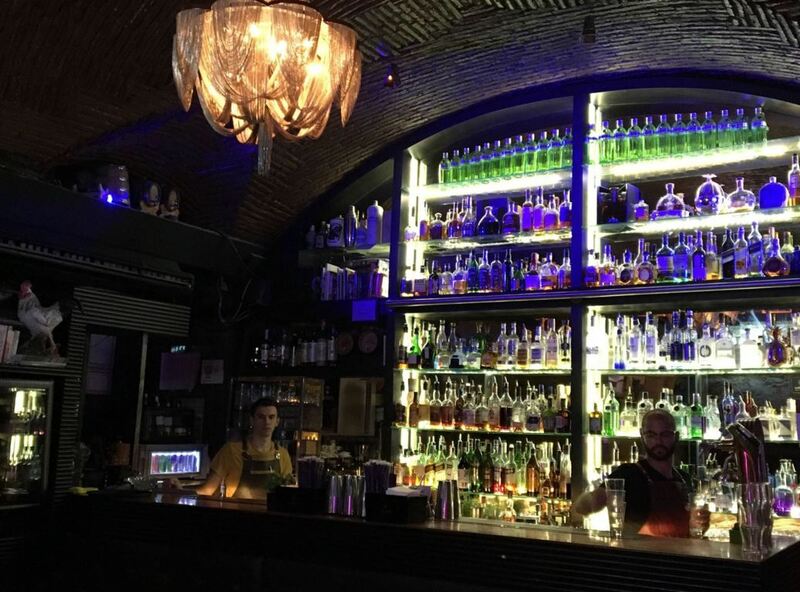 The centerpiece of the nightlife in Faro is Rua do Prior, which has several bars and clubs. There is a variety of music genres that you can enjoy in Faro. If you prefer more traditional music, you can visit a performance of Fado. Hotel Faro & Beach Club. This modern 4 star hotel offers spacious rooms and good service. There is a great buffet breakfast every morning. 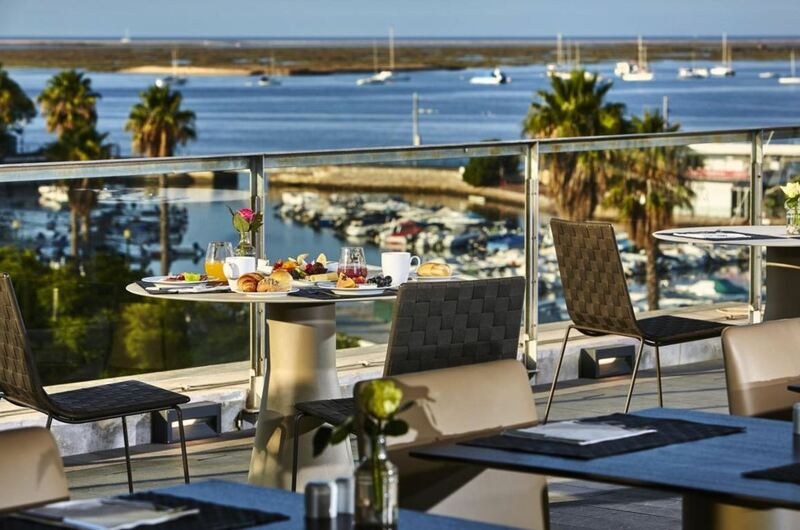 The hotel overlooks the natural park of Ria Formosa and the marina of Faro. The views are great. 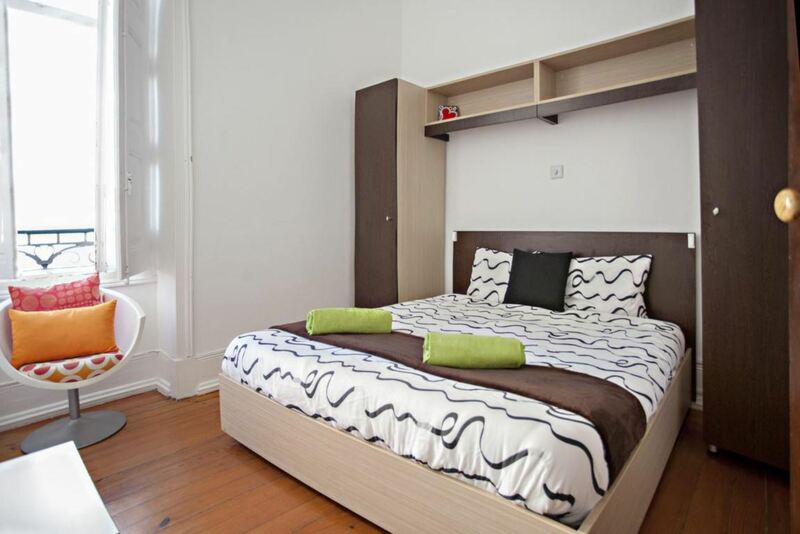 Perfectly located in the city centre. 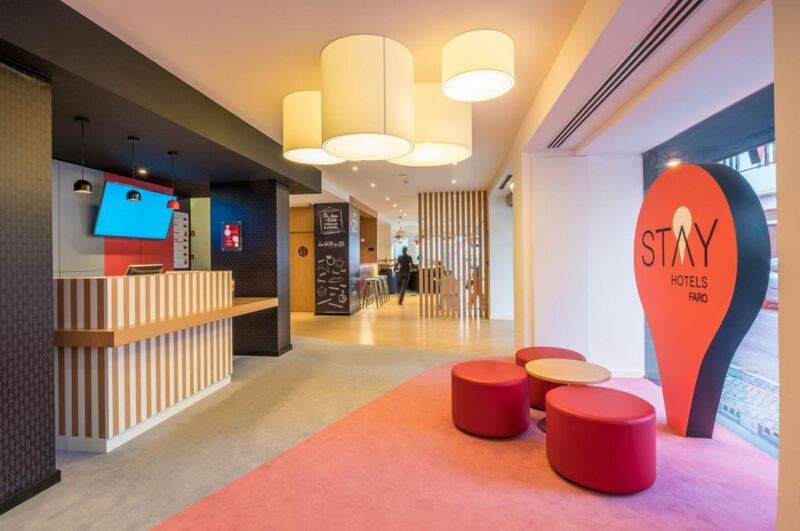 Stay Hotel Faro Centro. This 3 star hotel has all the basic facilities you need for a great holiday in the Algarve. The rooms are clean and comfortable. Located in the city centre. Baixa Terrace Hostel by My Choice Algarve. This hostel in the heart of Faro offers shared dormitories, as well as private rooms. It is a great place to meet other travellers. Good value for money. Faro is one of the best towns in the Algarve for shopping. You can find many shops in the old town, but there are also two separate shopping malls. 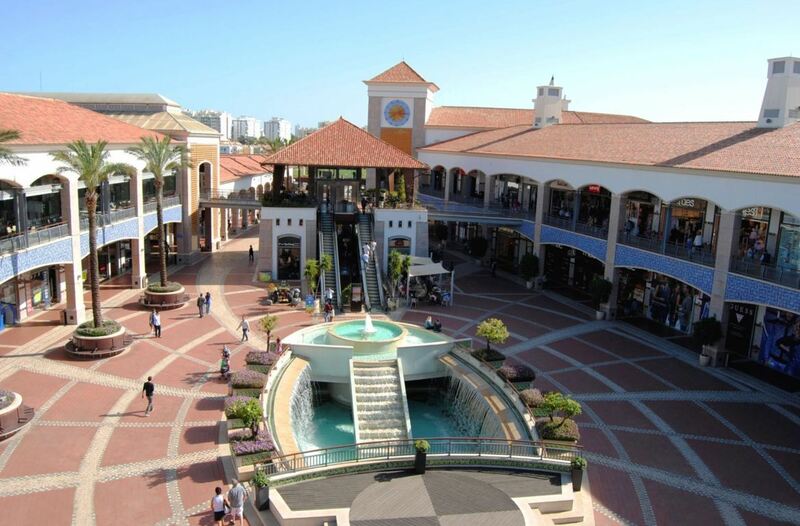 Forum Algarve is a shopping mall in Faro, located about 2 kilometres from the old town. It has 120 shops and a food court with about 20 restaurants. Some of the stores you can find here are Zara, C&A, Apple Store, Fnac, and Sportzone. There is a huge supermarket (Jumbo), where many locals do their day to day shopping. There is also a cinema for entertainment. If you are tired of walking around with shopping bags, there are plenty of seating areas. During summer, you can enjoy free concerts in the evening here. A huge parking garage underneath makes sure you will easily find a parking spot. 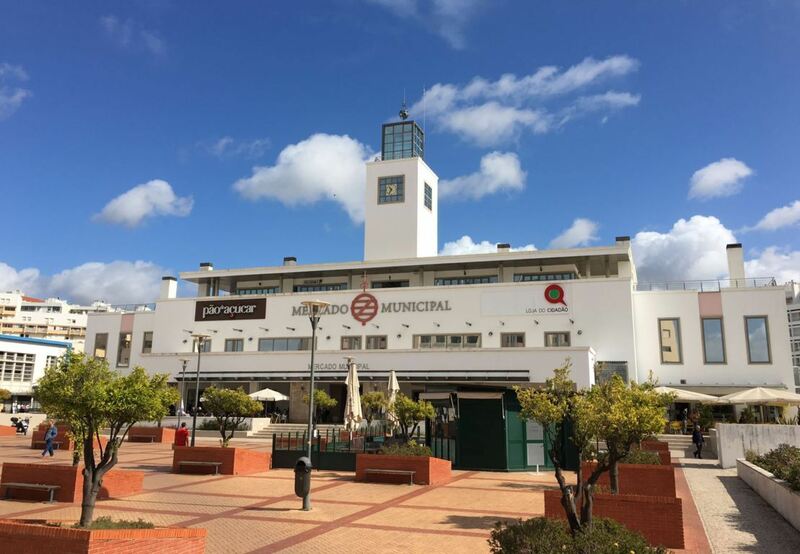 Mar Shopping is a relatively new shopping mall, located between Faro and Loulé. 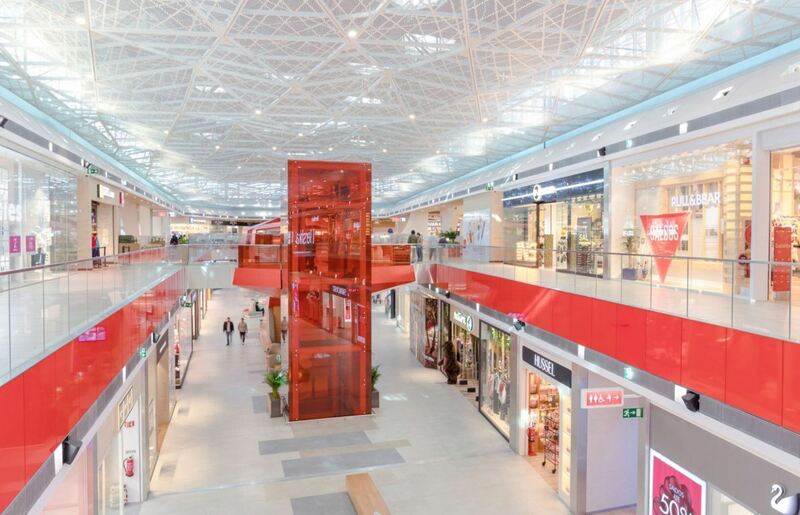 It combines a shopping centre with a designer outlet. Some of the stores you can find here are IKEA, Primark, Starbucks, Bershka, H&M and Zara. Mar shopping is quite unique, since it has the only IKEA in the Algarve, the largest Primark in Portugal and the first Starbucks in the Algarve. It also has a cinema and a food court. The designer outlet is located outside and feels like a small town. Mar Shopping has their own food concept called the Algarve Chef Experience. Here you can enjoy a top dining experience by a Portuguese chef, for not a lot of money. You can visit the municipal market (in Portuguese: mercado municipal) in Faro to check out fresh products from the region. There is a fish section, as well as a fruits and vegetables section. The municipal market is open every day (until 1 o’clock PM), except on Sunday. On Saturday it is extra crowded, since many locals come here to buy products. The municipal market is about 10 minutes walking from the centre. Address: Largo Doutor Francisco Sá Carneiro 52, Faro. In the fish section you can see many of different sorts of fish. Usually the fish are caught the previous night or the same morning, otherwise Portuguese people do not consider it fresh. There are two exceptions to the freshness of the fish: on Sunday and Monday. This is because fishermen usually rest on the previous nights (Saturdays and Sundays). That is the reason not many people buy fish on those days. This is also interesting for you if you intend to eat fresh fish in restaurants: do it from Tuesday to Saturday. If you eat fish in a restaurant on Sunday or Monday, the fish is likely not fresh and refrigerated for 1 or 2 days. The Ria Formosa is a natural park in the Algarve, that stretches from Tavira all the way to Faro. It is really beautiful. You can see a variety of wildlife there, including flamingos. The lagoons are ideal for birdwatching. It is highly recommended to take a boat trip and enjoy it yourself. 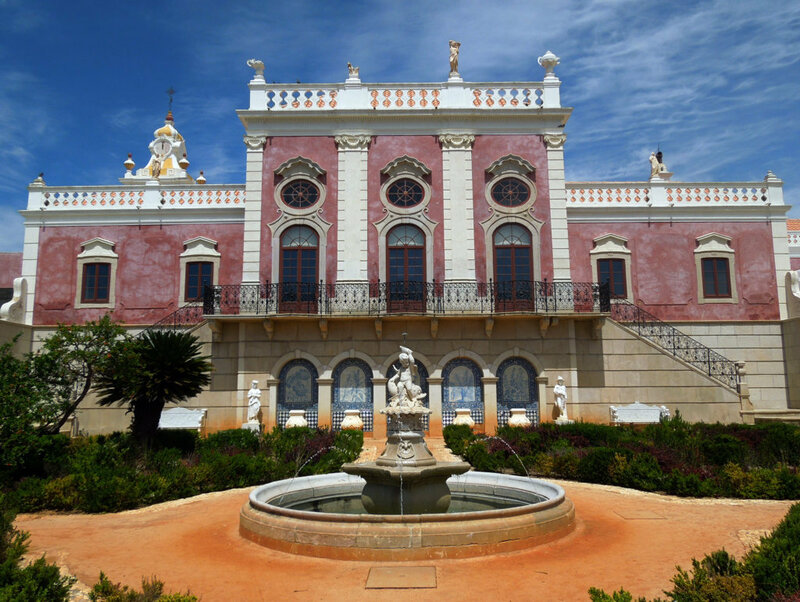 Faro is a great town, but there are also many other things to see and discover in the area. For example, you can take a trip to the Ria Formosa by boat. 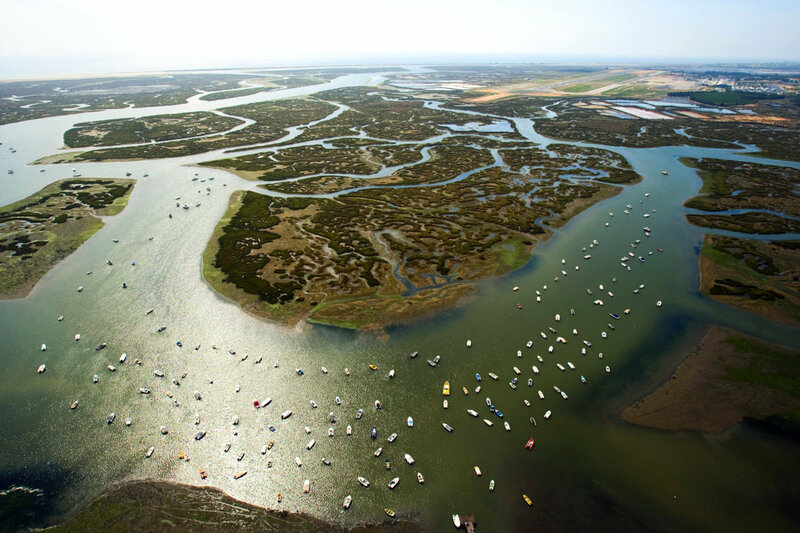 There are organized trips along the channels, marshes and islands of the Ria Formosa. If you have a good guide, you can get a lot of insight into the geography, wildlife and the traditional activities of the Ria Formosa. Some of these excursions you can already book online. Below you can find our favourite excursions in the area of Faro. Many tourists come to the Algarve every year. Almost all of them arrive in Faro, which has the only international airport of the Algarve. 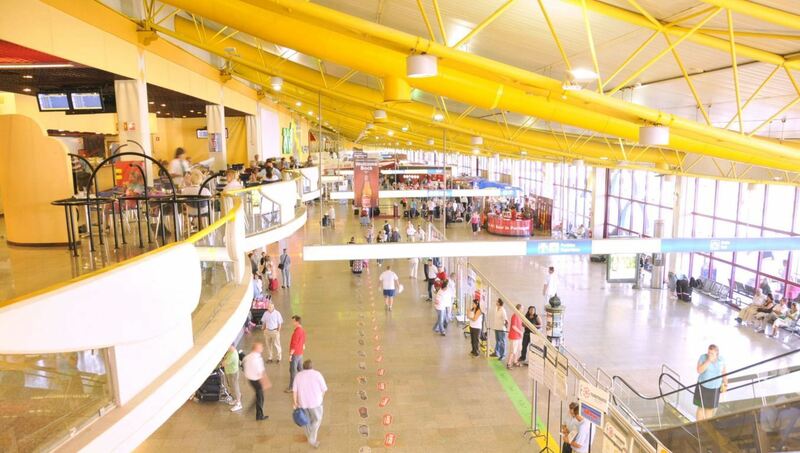 Faro Airport (FAO) handles more than 8 million passengers a year. The city of Faro has an excellent location in the Algarve and is the ideal first place to visit when you come to the Algarve. The airport is located about 4 kilometres to the west of the city. Festa da Ria Formosa. This 11-day-long festival in July/August celebrates the gastronomy of the Ria Formosa. You can enjoy seafood and regional specialties. There are concerts for entertainment as well. Held in Largo de São Francisco. FolkFaro. 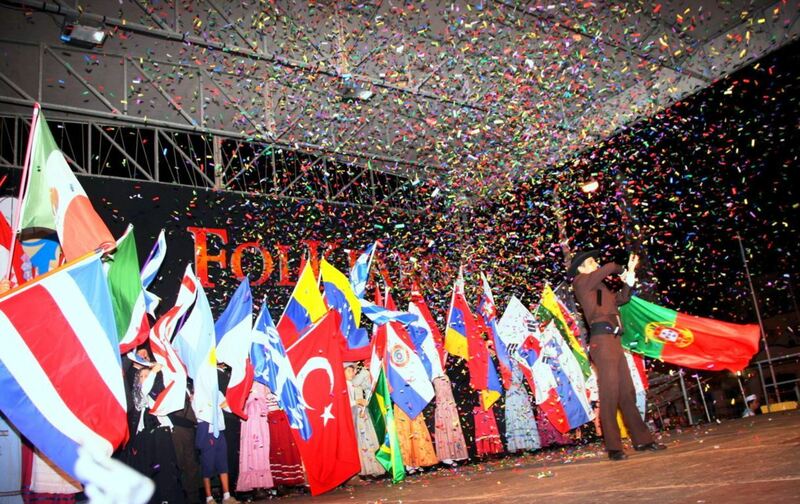 This is an international Folklore festival in August. It lasts for 5 days. During these days, you can find all sorts of entertainment on the streets of Faro. Feira dos Doces, Frutos Secos e Bebidas Regionais. This is a fair where you can buy regional sweets and dried fruits, as well as local drinks. It is held in August and lasts for two weeks. Feira de Santa Iria. This fair in October honours St. Irene with several exhibitions of craft work. Also, you can enjoy different kinds of entertainment. It lasts for 9 days and is held in Largo de São Francisco. During summer there are also several free concerts in Forum Algarve. Check their website for the dates. Probably you will also see posters all around Faro promoting these concerts. Faro (Sé e São Pedro). This includes the city of Faro and the old town. Conceição e Estoi. This includes the village of Estoi, which is famous for the Palace of Estoi and the Roman ruins of Milreu. Montenegro. This is a residential area outside the city. Also the University of the Algarve is located here. Santa Bárbara de Nexe. This is an old village where you can visit the Parish Church, which was built in the 15th century. In this region, there are some luxury villas of foreign residents and some Portuguese who like to live in the beautiful and quiet countryside, but not too far from the coast.